I have nothing against rich people. In fact, I’d verily love to be rich myself. Honestly, who but a few saints who’ve taken vows of poverty wouldn’t love to be rich. Personally, I like to think I’d do a lot of good for people who need lifting up if I had the wealth to help people (while enjoying the comforts and conveniences that wealth could bring me). But it seems to me we’ve lost our moral bearings with the way our Congressional leaders–most of whom are wealthy–are damning all the poor while enhancing their bank accounts and the accounts of all the wealthiest of Americans. There’s no shortage of shouting about the poor “gaming” the systems, but if you dare to point out the way the rich and powerful are gaming systems in far, far costlier ways for those of us who are middle class, you stand a chance of being labeled a socialist, communist or–worst of all–a librul! What follows is Thursday’s New York Times column from his greatness Nic Kristof about the current state of the nation’s “trickle-up economics,” with some points he makes that I’ve put in bold type for emphasis. What’s wrong with this picture he presents (with dripping sarcasm for emphasis)? What’s wrong, God help us, with this country? This ain’t how capitalism, or a nation of moral, fair-minded people, is supposed to work. In the meantime, money was slashed last year from the public housing program for America’s neediest. Hmm. How about if we house the homeless in these publicly supported yachts? Third, welfare subsidies for hedge funds and private equity. The single most outrageous tax loophole in America is for “carried interest,” allowing people with the highest earnings to pay paltry taxes. They can magically reclassify their earned income as capital gains, because that carries a lower tax rate (a maximum of 23.8 percent this year, compared with a maximum of 39.6 percent for earned income). Let’s just tax capital gains at earned income rates, as we did under President Ronald Reagan, that notorious scourge of capitalism. 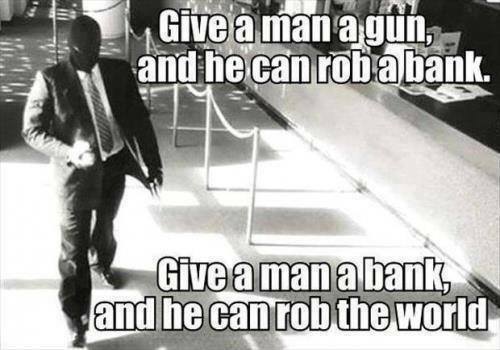 Fourth, welfare subsidies for America’s biggest banks. The too-big-to-fail banks in the United States borrow money unusually cheaply because of an implicit government promise to rescue them. Bloomberg View calculated last year that this amounts to a taxpayer subsidy of $83 billion to our 10 biggest banks annually. President Obama has proposed a bank tax to curb this subsidy, and this year a top Republican lawmaker, Dave Camp, endorsed the idea as well. Big banks are lobbying like crazy to keep their subsidy. You see where I’m going. We talk about the unsustainability of government benefit programs and the deleterious effects these can have on human behavior, and these are real issues. Well-meaning programs for supporting single moms can create perverse incentives not to marry, or aid meant for a needy child may be misused to buy drugs. Let’s acknowledge that helping people is a complex, uncertain and imperfect struggle. But, perhaps because we now have the wealthiest Congress in history, the first in which a majority of members are millionaires, we have a one-sided discussion demanding cuts only in public assistance to the poor, while ignoring public assistance to the rich. And a one-sided discussion leads to a one-sided and myopic policy. We’re cutting one kind of subsidized food — food stamps — at a time when Gallup finds that almost one-fifth of American families struggled in 2013 to afford food. Meanwhile, we ignore more than $12 billion annually in tax subsidies for corporate meals and entertainment. So let’s get real. To stem abuses, the first target shouldn’t be those avaricious infants in nutrition programs but tycoons in their subsidized Gulfstreams. However imperfectly, subsidies for the poor do actually reduce hunger, ease suffering and create opportunity, while subsidies for the rich result in more private jets and yachts. Would we rather subsidize opportunity or yachts? Which kind of subsidies deserve more scrutiny? The grandsons, making a joyful noise together. 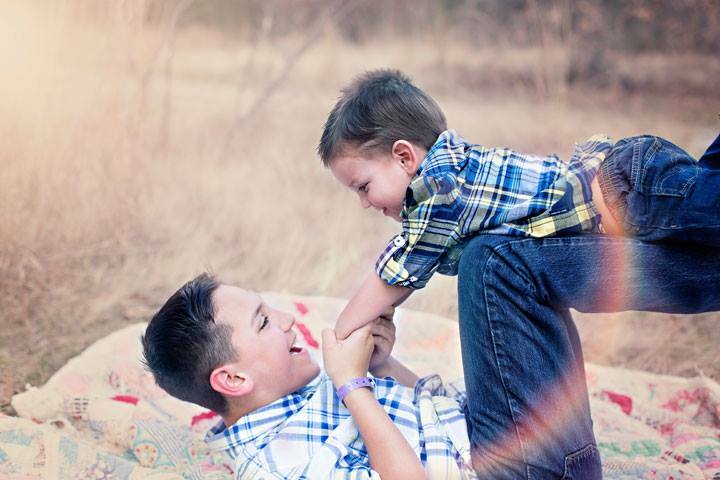 I’ve been in Texas this week, having good times with my grandsons. Trey just turned 11 and his little brother Rhys just turned Terrible 2. The grands are my bundles of joy, which ain’t to say that they always make me happy. Just yesterday, Rhys-the-Terrible threw a mini-basketball in my face, rearranging my glasses. In that moment I was not happy with him, and was made unhappier still by the joy he seemed to take in PawPaw being whacked smack in the face with his mini-basketball. But it all amounted to a fleeting moment of unhappiness that couldn’t begin to diminish the joy of having my grandson Rhys in my life. All of which brings me to joy and happiness, and love and sorrow. We’d never know joy in the fullest measure if we didn’t know sorrow. And the more we know suffering and love, the deeper the roots of joy extend. Being the theology nerd that I am, I’ve long had this quiet fascination with the likenesses and differences between spiritual joy and happiness. In seminary I once wrote a lengthy paper on what the ancient saints and traditional “doctors of the church” had to say about joy and happiness and sorrow, and the interplay of all three. The blame for this quirky interest lies with the Apostle Paul, with his list of “the fruits of the spirit” cited in his letter to the Galatians–followers with whom he was quite unhappy, by the way, judging from the harsh tone of the epistle. I go through that list in mind several times a day as a way of keeping tabs on how I’m doing in terms of loving others, embracing joy, being at peace with myself and others. I continue through the whole list, also monitoring my patience, kindness, goodness, gentleness, faithfulness and self-control. If I had any self-control and a lot more patience, not to mention faithfulness and other stuff, maybe I’d make the grade as a spiritual “A student,” or at least a high-C pupil, maybe. My aforementioned fascination in the difference between joy and happiness began one day long ago when I realized that “happiness” was not included in Paul’s fruits of the spirit. But “joy” was high on the list, second only to “love,” which came in at Number 1. Maybe joy ranked, and happiness didn’t, because joy is embedded within our hearts and souls. That which brings us momentary joy can certainly be that which brings us fleeting happiness, but what makes us happy doesn’t necessarily equate to joy. Because it lies as deep within us as the roots of an evergreen, joy is living in grace, gratitude and peace. 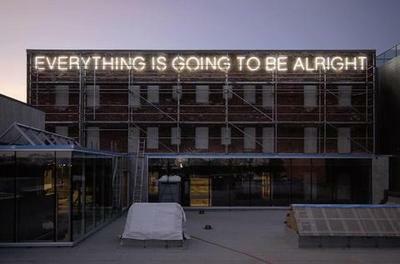 And one can live in grace and gratitude and peace with God even through times of enormous pain and suffering. Sorrow, not happiness, is the flip side of joy. We’d never know joy in the fullest measure if we didn’t know sorrow. And the more we know suffering and love, the deeper the roots of joy extend. Jesus connects love and joy in John 15: 1-17, where he talks about his being the “true vine” and our being the branches and urges us to abide in him as he abides in us in the Father’s love. “I have said these things to you so that my joy may be in you, and that your joy may be complete,” he says in verse 17. 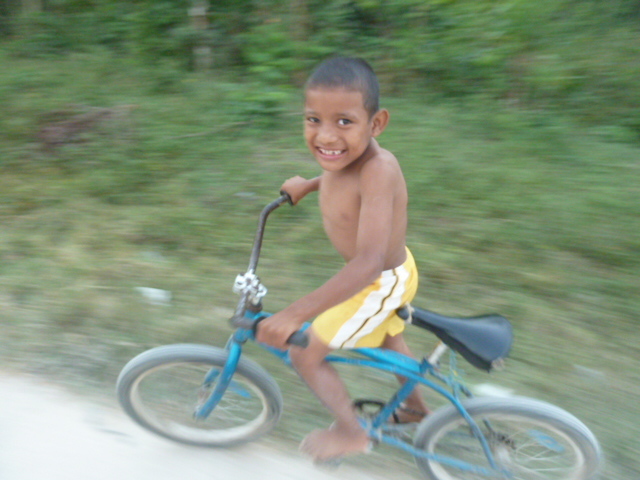 “Joy was in fact the most characteristic result of all Jesus’ activity amongst the poor and the oppressed. The meals he had with them were festive celebrations, parties. Jesus obviously had a way of ensuring that people enjoyed themselves at these gatherings. The Pharisees were scandalized by this . . . The poor and the oppressed and anyone else who was not too hung up on ‘respectability’ found the company of Jesus a liberating experience of joy” (pp. 50-51). Relishing an ice cream cone for five minutes can make anyone in the world happy for five minutes. A flush debit card on payday may bring happiness until the bills are paid. Many things can bring us fleeting joy, in the sense of happiness, in many ways every day. But spiritual joy—like the love we have for family and friends—endures. It’s getting ever harder in a noisy world of blaring TVs and loud background music and Hell phone conversations and ring tones to find a little peace and quiet and solitude and deep silence. But I submit that peace and quiet and silence and solitude–the state of being alone without being lonely–are essentials to creating the sort of holy life in which we can genuinely commune with God. They’re essential to spiritual and emotional health and healing. God a chance to speak. profound inner mysteries of life. Read more from Gerry Straub’s blog here. Just when you think America can’t get more shallow and mindless–just when you think you’ll hurl your lunch if you see one more picture or media report of some twisted young exhibitionist like Miley Cyrus or little-boy-lost Justin Beiber–along comes a young, gorgeous and classy talent like Lupita Nyong’o, an old soul of depth and beauty inside as well as out, who actually has something to say. God is love and love produces miracles. My Uncle Ledell and Aunt Newell were the oddest of all odd couples. So went the catchy jingle in Texaco commercials in the 1950s and into the sixties too. For years and many years, Uncle Ledell worked the 6 p.m. to 6 a.m. shift at the only gas station open 24-7 in Milam County, Texas. He never attended church and when it came to God, he was a doubter at best. She explained that they had this agreement before they married that they would agree to disagree about God and religion because Ledell wanted nothing to do with God and religion and Newell couldn’t get enough God and religion and that was that. Did I mention that this was an odd couple? My Aunt Newell was an old-time, primitive church, Pentecostal Christian who read and studied her Bible three times a day, attended church every time the doors were open, and got down on her knees every night at 9 p.m. on the kitchen floor and prayed and prayed and prayed, aloud, and fervently, and occasionally in tongues, which scared the pee out of me. The praying came after supper, and after she combed and brushed her hair, which reached to her ankles when it wasn’t all bunned up. She didn’t cut her hair, didn’t wear makeup, and didn’t eat much food that didn’t come out of the ground or out of the chickens out back. Her skin had the healthiest and shiniest glow of any woman I’ve ever seen in my life. Did I mention she prayed and went to church and read her Bible a lot? My grandmother and I used to board a Greyhound Bus and travel to Rockdale in Milam County to spend a few weeks every summer with this McKay Family Odd Couple, two of the happiest, most well-adjusted people, and most happily married of any couple that ever lived, surely. They were what Paul refers to in the Bible as “unevenly yoked”–one being such a believer and the mate not a believer–and yet love prevailed. My aunt, who along with my uncle is deceased, has been a huge inspiration and influence in my life, and more so since God started calling me and leading me to the ordained life in ministry back in the mid-nineties. But so has my uncle, the doubter–he who I’m pretty sure didn’t believe in God at all. The kicker here is–he believed in love as much as my aunt did. God is love, the Bible tells us, and if the Bible shows and tells us anything, it tells and shows us that love produces miracles. Did I mention that my Aunt Newell and Uncle Ledell were a miracle couple? See also: June 27, 2013 Jitterbugging for more about my mother and Aunt Newell. This is first in a series of regular Lenten postings you’ll find here between now and Easter. 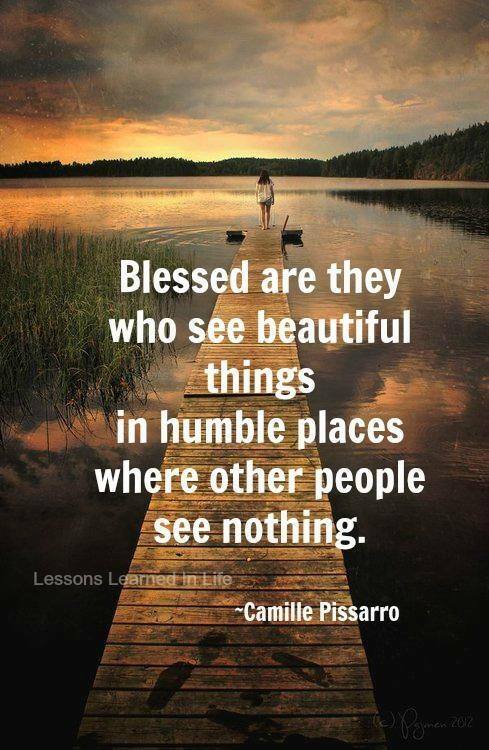 Grace and peace and blessings on you all, dear readers. Ash Wednesday is a Christian tradition that capitalism seems incapable of vulgarizing the way that market forces have vulgarized Christmas and, to a limited extent, even Easter. Ash Wednesday reminds us that from so much holy star dust we were made, and to so much Godly star dust we’ll return. It’s such a serious and holy day in the church tradition that it can’t be commercialized and packaged in pretty paper or sold in the form of chocolate eggs and bunnies. In my lifetime I’ve seen Ash Wednesday grow a lot in popularity, which ain’t to say it’s grown as popular as, say, Super Bowl Sunday (Sunday being the traditional Sabbath Day that is supposed to be kept Holy). And it’s sure not as popular as your ever-more popular Sabbath Day gun shows. Still, I’ve seen it grow from being a day that relatively few devout Catholics and Episcopalians observed, to a day that Protestant denominations like my own United Methodist Church have rediscovered and recovered. Today in America you’ll see more people walking around with what look like smudges of dirt on their foreheads than you saw last year. I dare say Ash Wednesday has become a cool event in a culture that just can’t seem to get enough cool stuff, dude. Increasing numbers of American Christians now attend the many Ash Wednesday church services offered in an ever-growing number of churches. Maybe that’s a sign that Americans are hungry for something that’s not cool, but something that’s meaningful and serious. The imposition of the ashes in the Christian faith-and-church tradition is not–or not supposed to be–some sort of holy, spiritual quickie. It’s the first step in the process of spiritual formation in the holy and very holy season of Lent. 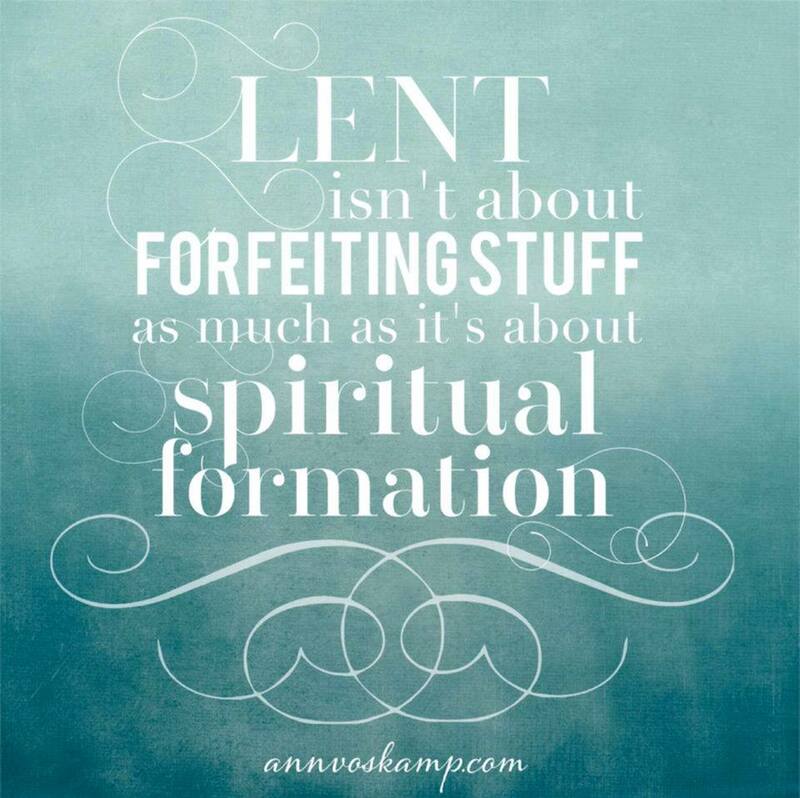 And Lent is not about fasting or giving up something for the sake of showing some kind of vague, spiritual self-discipline. Real fasting will make your stomach growl, and the growl in that empty space within you can be like the chime of a church bell–a reminder to turn your attention to the presence of God within you and around you. The 40 days that Jesus spent in the wilderness, totally reliant on God for his survival out there, were 40 days of spiritual formation. Ash Wednesday is not some quick and down and dirty nod to something vaguely Godly and holy. It’s one relatively small gesture packed with theological meaning, and a good first step to 40 days of deep, spiritual formation. More on Lent from Methodist pages here and here. And this from a Catholic perspective. 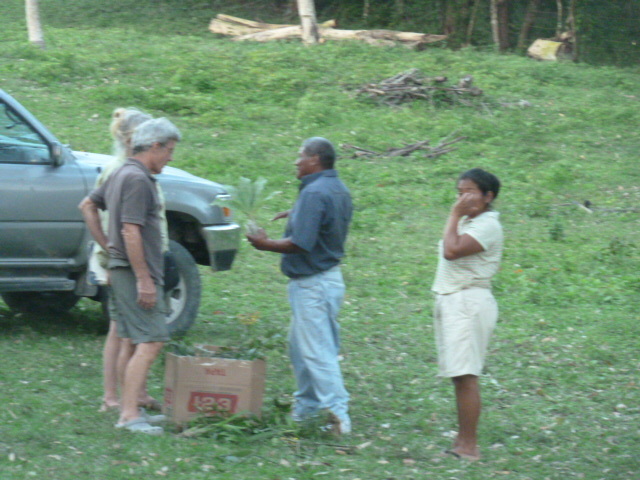 Village people, prepping plantain leaves for tamales. 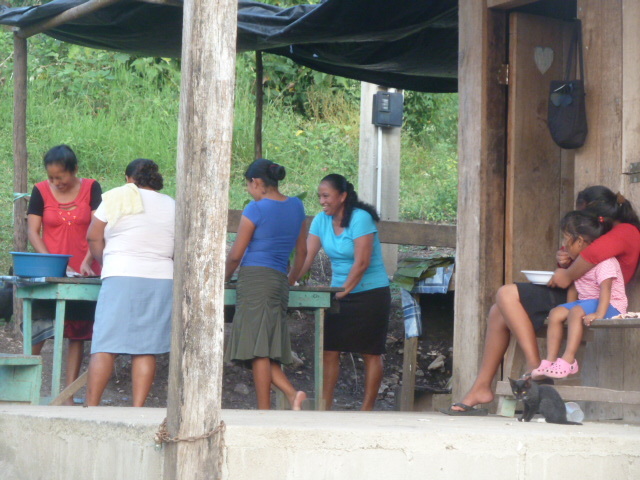 Welcome to a special Sunday edition of Belizean postcards from a couple of happy-people villages I’ve visited lately. Scroll on . 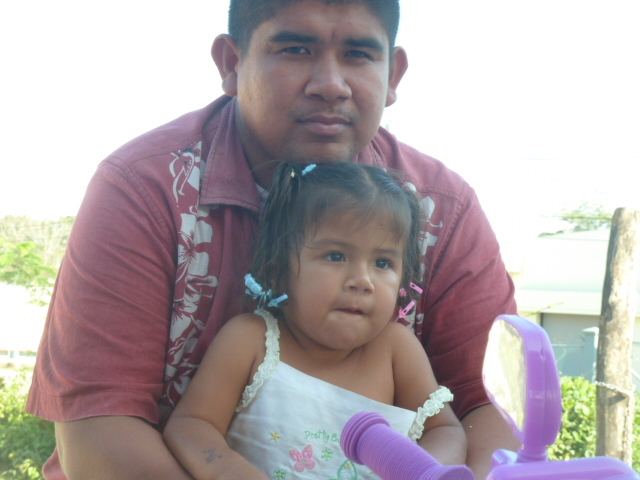 . . . .
My friend Antonio with one of his four children. He works at a beach resort in Placencia on the southern Belizean coastline, working 10 days and coming home to western Belize for three days at a time. He dotes on his children when home and is as loving a family man as I’ve ever seen. A school bus runs to market early on Saturday mornings and heads back to Seven Miles promptly at 1 p.m. Antonio and Lady, however, lost track of time and missed the bus, so I offered to take them home. 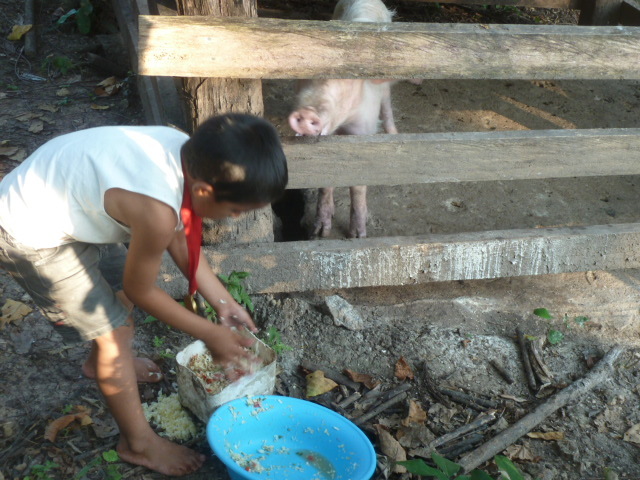 They live with Lady’s parents on the family’s 55 acre farm with the four kids, a horse, a pig and enough chickens and baby chicks running around to feed Belize. 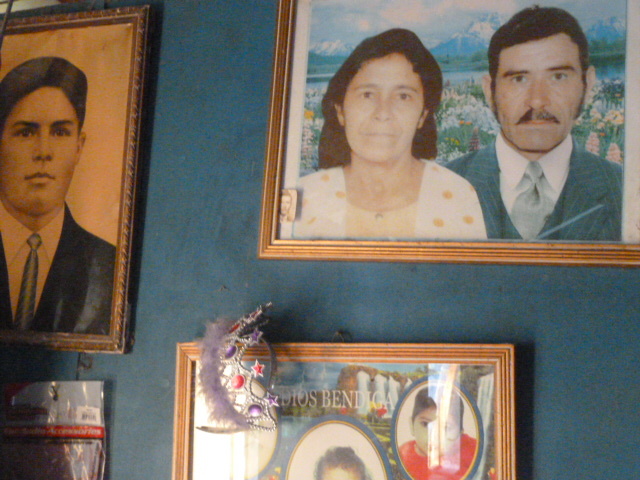 Antonio’s parents in the younger days. Lady is camera shy but did catch this snap of her happy face. Lady’s mom, on the other hand, is a total extrovert, pictured here hamming it up on a neighbor girl’s tiny tricycle. 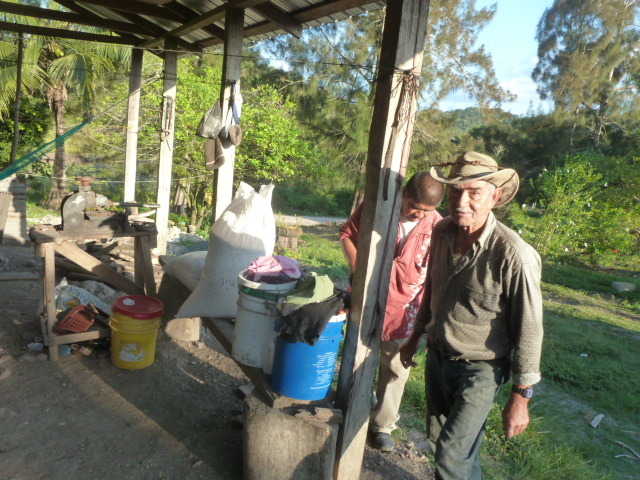 Antonio’s father in law farms about 10 acres of 55 he owns. He’s rents out another 20 acres. 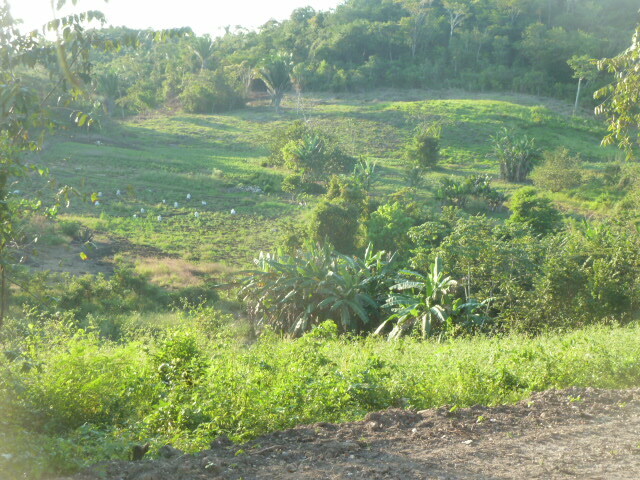 A view of the family’s beautiful, lush farm. You name it, it’s planted out there: tomatoes, cucumbers, sweet peppers, spuds, pineapples, plantains, papaya and mango trees, among other stuff. Families have everything you need up here, including water service, and excepting electricity, but who needs that–that’s what lanterns are for. 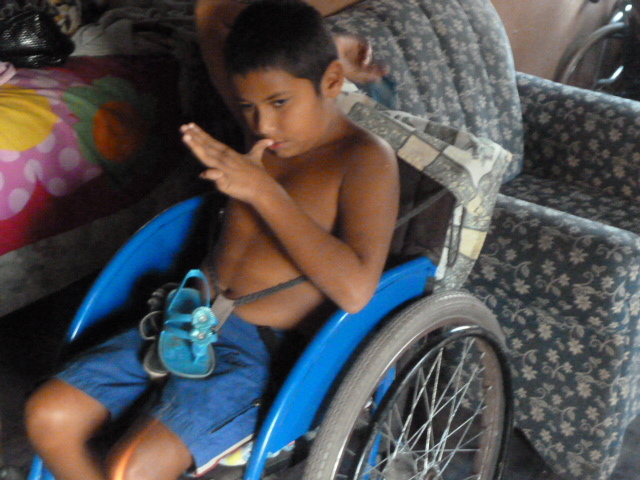 Antonio’s 10-year-old son can’t walk or talk, but loves to go swimming and caving in inner tubes. There’s ancient water caves complete with Mayan bones and skulls and artifacts around less than a mile from Antonio’s home. 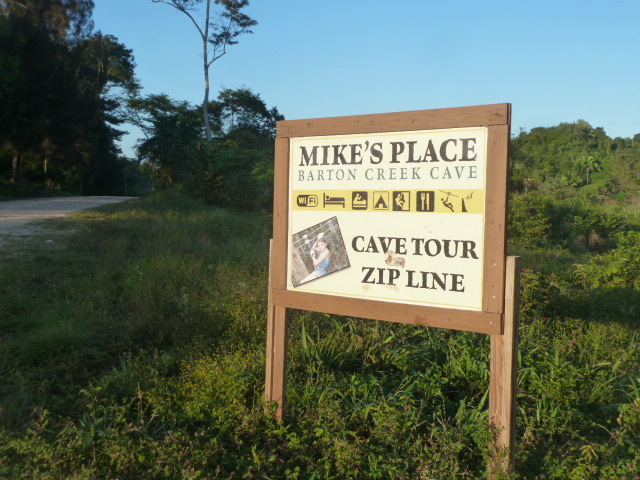 Mike’s Place is a popular tourist attraction with cave tubing in ancient caves, and zip-lining. Another popular place for zip-lining, Calico Jack’s, is in Seven Miles Village near Antonio’s family farm. 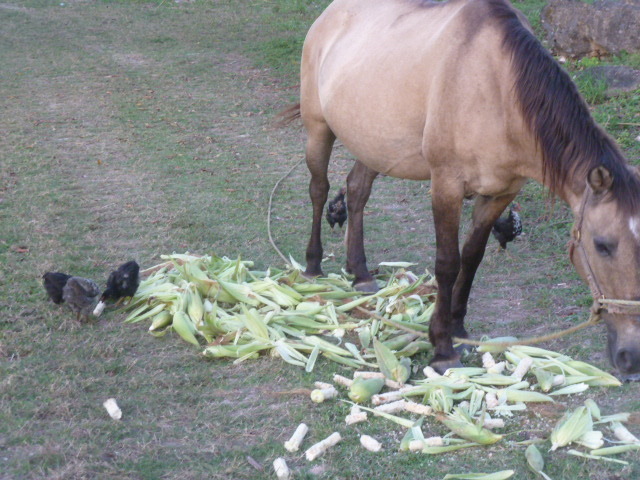 The horse shares the corn with the chicks, which is the neighborly thing to do after all. Porky eats like a pig and don’t share nothin’. 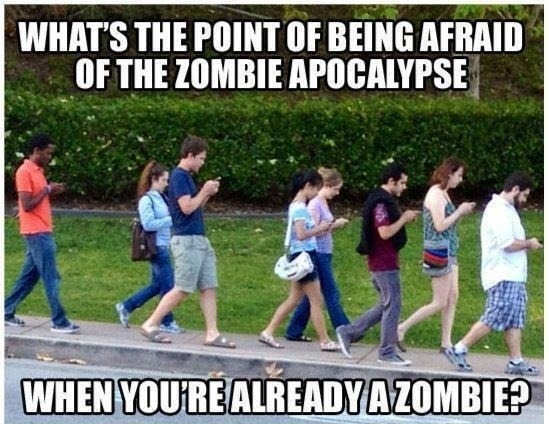 Meanwhile……. back in the village of Calla Creek on the other side of western Belize, I recently went for a long, aimless walk with the camera. 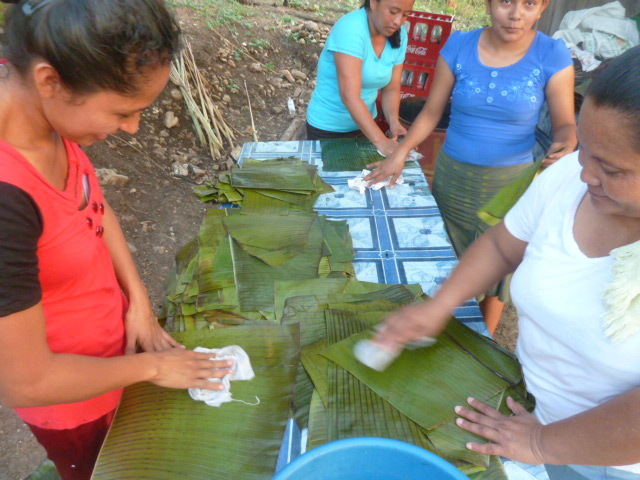 It was here in Calla Creek Village that the ladies of the Living Waters Church were washing plantain leaves for the tamales they made Friday night to sell in San Ignacio on Saturday, market day, when people from villages from 20 miles and farther pour into San Ignacio, the hub of trade and commerce in far Western Belize. The kids weren’t involved in tamale making; just giggled at the gringo with the camera a lot. This heavily secured house overlooks the river in a scenic setting. 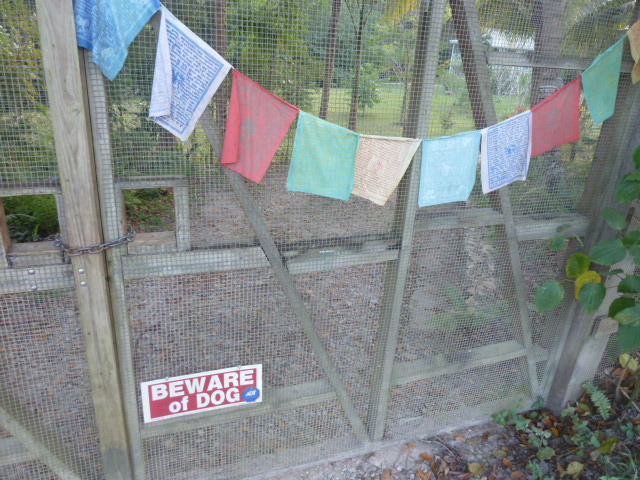 “Nastase”: the entrance to the riverside place has these fading, Tibetan Buddhist prayer flags at the gate. 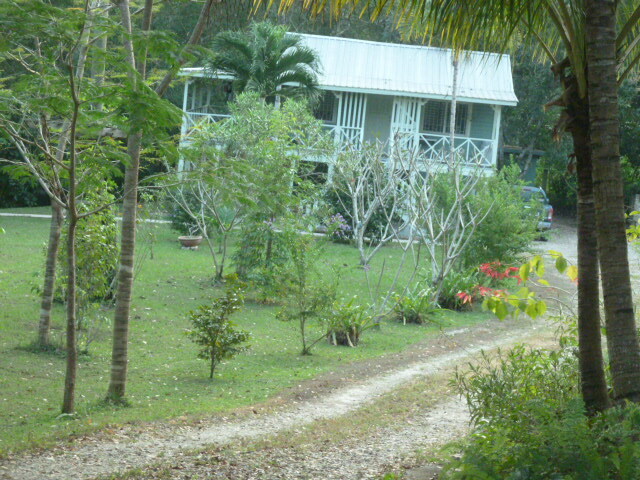 Maybe the Dalai Lama has a Belizean retreat house at Calla Creek Village? 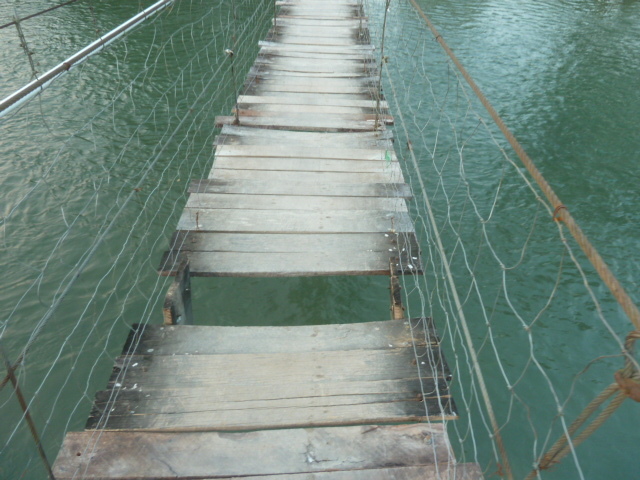 How to get to the other side of the Mopan River on the swing bridge at Calla village? Holding your breath and praying helps. 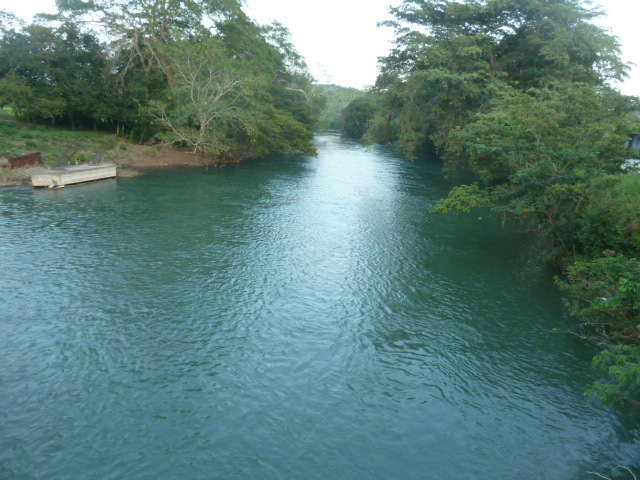 The mighty Mopan; hard to imagine the kazillions of Mayan canoes that used to pass here at Calla, which is not far from the big Mayan Xunantunich ruins where you can scale up a temple and see miles and miles of Belize and Guatemala too. So I got across the swing bridge to find this American expat couple, who have 50 acres of land down the road, buying orchids from a Belizean couple they’d made an appointment with. About 100 feet from there I met an American expat who bought a house he’s living on in 1995, but he only moved to it six months ago and is building a bigger house to stay permanently. It’s not as if I stumble across American expats out in the boonies every day; it was a little strange to meet these Americans all in one walk down the backroads. 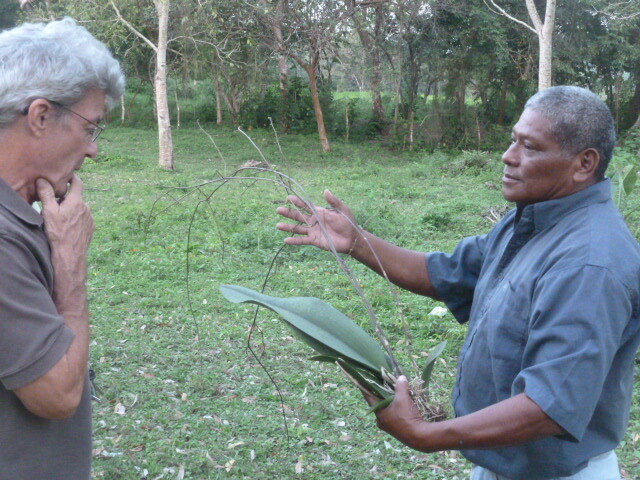 Belize is a wonderland of unique and beautiful orchids and flowers. Plant, and it will grow. 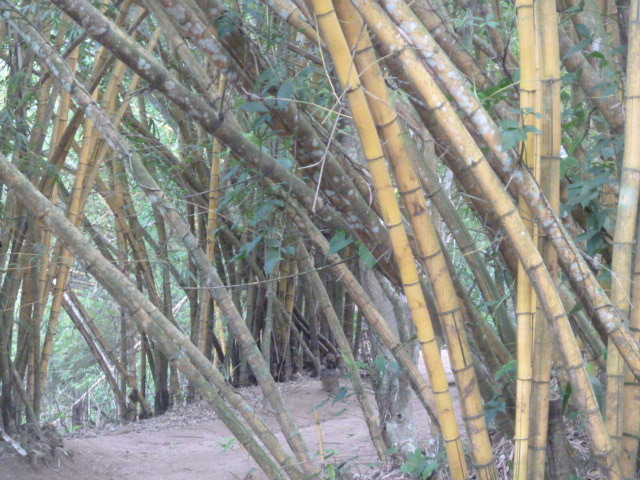 Another Calla Creek Village attraction: nice bamboo in places on the riverside, which makes for nice and very nice furniture. 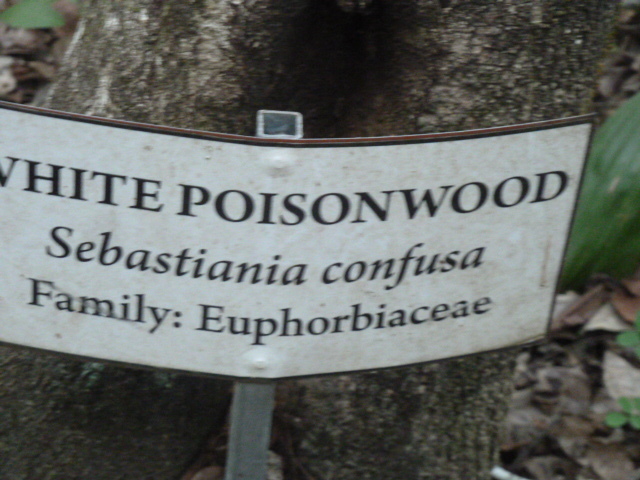 Until next time, don’t be hugging the poison wood trees, tree huggers.